That feeling you get where you eat to much food, that was me today. I stood next to a group of older men whose digestive process included burping while we prayed the late night prayer. The late night prayer- or Taraweeh- are these extra prayers that Muslims pray during the month of Ramadan. Ramadan, as a Muslim month is sacred for many reasons, primarily it is the month that Quran, Islam’s holy text, was revealed to Prophet Muhammad (SAW). The month is significant not just in our fasting during this time period, but because our fasting is a voluntary obligation observed between ourselves and God, which heightens the sense of spirituality experienced during Ramadan. Prayers, reading the Quran, not eating, eating, meeting friends, making supplications- all these things become part of our daily spirituality more than anytime of the year. So when I stood next to these men during prayers smelling their acidic breath along with the dinner they had (often times biryani) I felt sick to my stomach. It didnt help that I also splurged on dinner as well, to the point that it hurt when I stood up for prayers. I felt like I was a pregnant woman, needing to waddle over to a chair to sit down and catch my breath. I mean who does that? Well I did that. The ramifications of my actions were quite clear. My spiritual experience focused on the chicken I was trying to digest in my stomach and not all over the prayer carpet or the peopel praying around me. If I want to fine tune my connection with God during this Ramadan, I realized after prayers yesterday that I need to better understand the Prophetic example of fasting, more specifically for eating. What does it mean to eat enough? I know that last night I had gone above and beyond “eating enough”. No man should feel the way I do and the way I felt was gluttonous- like a stuffed pig ready for the Christmas table. To feel like that is a sin. According to the Prophet SAW “the human being has never filled a container worse than his stomach.” Al Ghazzali in his “Revival of the Religious Sciences” (Ilya-ulum al-din) had a special section titled “On the Treatment of the Lust of the Stomach and the Sexual Organs” where he suggests that the source of lust is to be found in the stomach. Adam AS ate from the apple tree because of his desire to eat from the fruit and ever since then his descendents have fallen prey to that weakness over and over again. From that I get the One-Third rule for eating sufficiently. Remember that from this hadith the Prophet SAW gives us 3 categories- necessary, sufficient and supplementary. Necessary is eating what you would need to eat in order to not die. Sufficient is defined in the hadith as eating “a few bites to strengthen the backbone”- meaning you preserve your body, give it sustenance and nourishment to allow it to do the work it needs to do, so you don’t fall over backwards when doing your work. And supplementary ON THOSE SPECIAL OCCASIONS- which for us today it seems like its EVERY FREAKING DAY- we should eat 1/3 substance, 1/3 water and leave the last 1/3 for breathing room so we all don’t look like we got ourselves 4 months pregnant. Speaking to special occasions, I fear that part of our lose of humanity stems from our ability to constantly live in a time of plenty. Where we have access to all sorts of food, meats at all times, fruits that don’t grow during the winter. 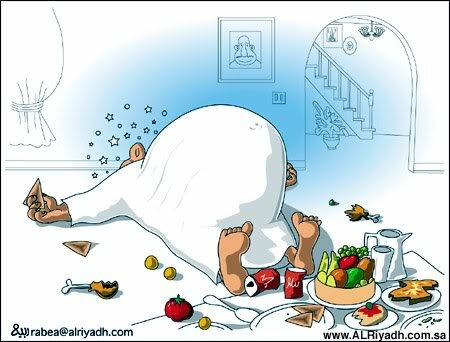 Imam Ibn Qayyim al Jawziyaa states that “this case becomes more harmful when it becomes a habit” where we indulge ourselves not occasionally in delicious foods that are rich in fat and calories. Surah Al Araf states “and eat and drink, but waste not by extravagance, certainly Allah likes not Al-Musrifun (those who waste by extravagance)” (7:31). I am so saddened to know that people are dying from hunger and starving in East Africa while I eat my body into a fit of indigestion. There truly is a hikma (wisdom) in the teachings of the Prophet SAW which is what I frame Day 2’s reflection on. I will work hard to implement the 1/3 rule throughout Ramadan and beyond.